When ordering or registering on our site, as appropriate, you may be asked to enter your: name, email address, mailing address, phone number, or credit card information. You may, however, visit our site anonymously. To process transactions. Your information, whether public or private, will not be sold, exchanged, transferred or given to any other company for any reason whatsoever without your consent, other than for the express purpose of delivering the purchased product or service requested. To send periodic emails. The email address you provide for reservation processing will only be used to send you information and updates pertaining to your stay. 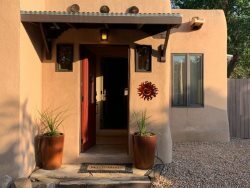 If you decide to opt-in to our mailing list, you will receive emails that may include company news, new Santa Fe vacation rentals, updates, related product or service information, etc. Occasionally, at our discretion, we may include or offer third party products or services on our website. These third party sites have separate and independent privacy policies. We, therefore, have no responsibility or liability for the content and activities of these linked sites. Nonetheless, we seek to protect the integrity of our site and welcome any feedback.